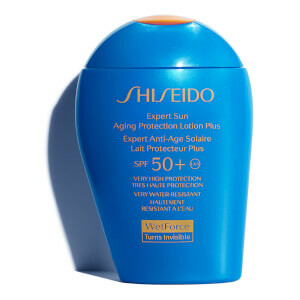 Achieve an effective defence against damaging UV rays with Shiseido Expert Sun Ageing Protection Lotion, a lightweight sun cream that uses innovative technology. The brand’s SuperVeil 360 ensures that the formula works best when in contact with water and perspiration, meaning you’re free to enjoy the outdoors without worrying about your sun protection. The lotion smooths on effortlessly without becoming sticky, creating an invisible barrier against UV rays and harmful free radicals. Whether swimming, playing sports or just relaxing in the sunshine, the sunscreen will ensure your skin is healthy and protected at all times. Shake well before use. Apply after your regular skincare. Before sun exposure, apply generously and evenly over the skin (can be used on face and body). To remove, rinse off thoroughly using daily cleanser. Water (Aqua), Diisopropyl Sebacate, Isododecane, Polymethylsilsequioxane, Butylene Gycol, Alcohol, Triethylhexanion, Octocrylene, Isohexadecane, Titatnium Dioxide (Nano), Dimethicone, Lauryl Peg-9 Polydimethylsiloxyethyl Dimethicone, Butyl Methoxydibenzoylmethane, Polybutyele Glycol/Ppg-91/1 Copolymer, Glycerin, Trimethylsiloxysilicate, Disteardimonium Hectorite, Sucrose Tetrastearate Tricetate, Xylitol, Hydrated Silica, Benzophenone-3, Bis-Ethylhexyloxyphenol Methoxphenyl Trizane, Triethoxycaprylylsilane, Phenoxyethanol, Disodium Edta, Fragrance (Parfum), Dextrin Palmitate, Methyl Gluceth-10, Polymethyl Methacrylate, Talc, Distearyldimonium Chloride, Limonene, Linalool, Stearic Acid, Peg/Ppg-14/7 Dimethyl Ether, Saxifraga Sarmentosa Extract, Butylphenyl Methylpropional, Benzyl Benzoate, Hexyl Cinnamal, Eugenol, Geraniol, Syzygium Jambos Leaf Extract, Ectoin, Tocopherol, Sophora Angustifolia Root Extract.